From August 1 to 5, the China-UAE Graphene Industry Summit & China International Graphene Industry Union Projects Promotion Conference to UAE was held successfully at Abu Dhabi Palace Hotel and Atlantis The Palm. It is announced that the Abu Dhabi division of China International Graphene Industry Union (CIGIU) was officially established at the conference. 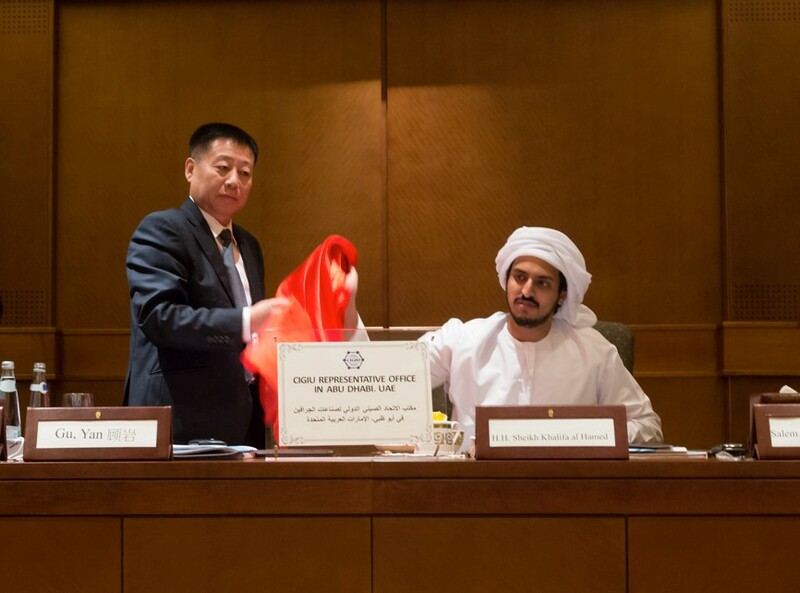 This event deepens the cooperation between China and the United Arab Emirates in graphene preparation technology and its industrialization application, and promotes the development of the international graphene industry. The Summit also indicates that the internationalization of graphene industry in China will go further again. China-UAE Graphene Industry Summit is hosted by the Office of Prince H.H. Sheikh Khalifa al Hamed and the China International Graphene Industry Union, organized by the Royal Diamond Group of UAE and the Abu Dhabi Division of CIGIU, supported by the China Public Diplomacy Association, the China Culture Media Group, the China Culture & Art International and the World Science Finance Group. Since China and the UAE established diplomatic relations in 1984, the friendly and cooperative relationship between the two countries develops smoothly. In recent years, the relationship between China and the UAE presents a trend of comprehensive and rapid development. Exchange visits between high-levels and contacts in each levels of the two countries are frequent. And the two countries support and coordinate with each other in both international and local affairs. As the key juncture of economic transformation in both two countries, the so-called “king of new material,” graphene, becomes a key subject and focus of technology industry cooperation of the two countries. In order to promote cooperation and communication in technological innovation between China and the UAE, invited by Prince H. H. Sheikh Khalifa al Hamed and the Royal Diamond Group, CIGIU will visit Abu Dhabi as well as Dubai in UAE in group from August 1 to 5, 2016, and hold the China-UAE Graphene Industry Summit & China International Graphene Industry Union Projects Promotion Conference to UAE. During the visit, CIGIU arranged several targeted and small-scaled programs matching symposiums for its member enterprises and achieved remarkable results. The CIGIU delegation in the visit consists of 20 members including Vice Executive Chairman of CIGIU, Secretary General and principals from branches including Beijing, Shenzhen(China), London(UK), Tokyo(Japan), Lisbon(Portugal), Los Angles, New York(USA), Riyadh(Saudi Arabia), well-known professionals in international graphene field, and successful entrepreneurs in China graphene field. The CIGIU delegation has also received warm welcome and hospitality from Mr. He Song, the counselor of the Department of Economic and Commerce of the Embassy of the P. R. China in the United Arab Emirates. Mr. He listened carefully to the introduction of CIGIU, expressed welcome to the Union for holding the Summit and making investments in the United Arab Emirates, and also talked about the matters which call for attention from Chinese enterprises to make abroad investment and cooperations. What’s more, Mr. He expressed his willingness to offer help to facilitate the industrial development of the CIGIU members in the United Arab Emirates. This visit is highly related with the mission of CIGIU orientating that “global insight, international cooperation”. Through building international platform, integrating global technology, finance, industry, government and other resources, the Union will promote industrialized application of this international new graphene material. The massive industrialized application of graphene will change the structure of world energy sources in future. China has about 70% of the graphite resources in the world. In recent years, patents related to graphene held by Chinese take over one third of that in the world, so that the industrial application of graphene in China is on the top of the world. As the UAE is searching for technological innovation and development and boosting the modern industry to develop the country in “post-petroleum era”, taking the opportunity to accelerate cooperation and fulfill the update of the industry bears great significance in development in the field of technology for both China and the UAE. During the China-UAE Graphene Industry Summit & China International Graphene Industry Union Projects Promotion Conference to UAE, member enterprises of CIGIU discussed the road of cooperation in graphene technology, industry, capital, and cooperation and achieved a series of essential cooperation intentions with royal family members of Abu Dhabi (UAE), entrepreneurs, and investors. Chairman of Royal Diamond Group of the UAE, Prince H. H. Sheikh Khalifa al Hamed of Abu Dhabi indicated during the address that the next step is to actively promote the development of CIGIU in the UAE. He hopes that through the development of new-material technology represented by the graphene, it will help the UAE move toward the post-petroleum era and provide technological support for the economic development of the UAE. On the Summit, Gu Yan, Executive Vice Chairman of CIGIU, introduced the mission of the Union—Proceed from China and embrace the world, establish an inclusive platform for international collaboration in graphene industry, science & technology, and finance, set up a sharing mechanism for resources covering industrial research information and intellectual property, push forward the construction of the standard, assessment and quality examination system and facilitate industrialized application and production technology of graphene so as to promote the development of global graphene industry. Gu Yan indicated that the Union will promote the cooperation and communication in the field of China-UAE graphene industry and science and technology innovation, and create a global cooperation mechanism for graphene with the help of the international platform. Dr. Xiao Xiaoyue, Vice Chairman of CIGIU and Director of International Cooperation Commission, Chairman of Nanjing Kefu Nanometer Technology Limited, delivered a speech about the technological innovation driving upgrade of graphene industry in the China-UAE Graphene Industry Summit. He expressed that researches on graphene application are very popular globally today. Many institutions and enterprises participate in the R&D and industrial application of graphene, and they mainly focus on the field of integrated material, power battery, painting material, flexible touch screen, etc. With the continuous upgrade of graphene technology and improvement of the application, the entire graphene industry will reach a total value of a hundred billion dollars. Dr. Xiao Xiaoyue also indicated that CIGIU will conduct the programs matching with enterprises of UAE, achieving practical cooperation and benefiting each other with advantages. As a well-known professional and leading entrepreneur in the field of global graphene application development, Dr. Xiao Xiaoyue focuses on promoting massive production of graphene domestically and internationally and the chain management and commercialization of the industry. His keynote speech aroused a huge response at the Summit. During the Summit on August 2, Jooie Group, member enterprise of CIGIU, introduced its world-leading second generation optical fiber technology and situation of R&D of graphene optical communication. After the conference, Jooie Group signed legal documents to establish a co-funding company with Royal Diamond Group and CIGIU Funding, and will set up a co-funding enterprise in Abu Dhabi and pick up a location as a manufacturing base of second generation optical fiber and development center of graphene industrialization. After the communication at the Promotion Conference organized by the China Art International and Riyadh division of CIGIU, Fu Guanghua, Chairman of Jooie Group, signed the Comprehensive Strategic Cooperation Agreement with Malik Aime Galen Abdel, representative of the Abdel family, investment banker in Saudi Arabia from on August 4, and discussed about cooperation of the second generation optical fiber entering the market of Saudi Arabia and establishment of a manufacturing base. During the road show of the programs, Zhang Fuying, Chairman of Yiren Group, introduced the development layout of the enterprise in the field of graphene application and had a deep communication with the guests in the conference about how to use high-tech to change the roles of traditional enterprises and laid a good foundation for future cooperation. During the Summit, Prince Sheikh Khalifa and Gu Yan, Executive Vice Chairman of the CIGIU unveiled Abu Dhabi Division of CIGIU and announced its official establishment under the witnesses of both domestic and international guests. The UAE, as an economic power in the Middle East, enjoys political stability and carries out a series of support policies to encourage scientific and technological progress and innovation.The official establishment of the CIGIU Abu Dhabi Division bears a great significance and brings the world latest technology of graphene to the UAE to help its nation to realize scientific and technological progress and grasp the opportunity in “post-petroleum era”. In the unveiling ceremony, the main functions of Abu Dhabi Branch of CIGIU are announced as follows: Firstly, to build a routine work connection between CIGIU and the United Arab Emirates and its nearby countries and regions so as to channel the worldwide resources to the local member companies and help them get the world latest information; Secondly, to upload the latest graphene technology and the latest information of the related technology and needs of the United Arab Emirates and its nearby countries and regions; Thirdly, to promote a closer communication and the complementarity of resources among the regional members of the Union and provide various technology, capital and market resources for their development through various conferences, forums, and project roadshows that the divisions of CIGIU lead or participate in. CIGIU made several agreements with royal family members of Abu Dhabi, local well-known entrepreneurs, investors and others during this Summit. They all agreed on that the development of graphene industry needs international cooperation and gives full play to each one’s advantages to promote continuous development of the industry. The well-known lawyer of the UAE, Obeid Al Suwaidi, indicated that there will be many enterprises in UAE interested in becoming member enterprises in CIGIU and participating in the building and sharing of the international platform provided by the Union. CIGIU has always been attaching great importance to the international development of graphene industry . At the preliminary conference of the first council of CIGIU held in Beijing, China, CIGIU has put forward its orientation, i.e. a public service platform in international graphene field to promote the rational use of the graphene resources, the development and progress of the industrial technology, the integration of graphene production, study and research, the combination of production and finance as well as the industry standardization and credit assessment on May 26th, 2016. Up to now, CICGU has set up divisions worldwide in Beijing, Shenzhen, New York, Los Angles, Singapore, New Delhi, Bangkok, Sydney and Abu Dhabi, and will establish divisions in major cities like Hong Kong, Tokyo, Riyadh, Doha, Frankfurt, Madrid, Lisbon and Lima, etc. All these divisions of CIGIU will work with the local government and influential bodies to participate in the affairs of CIGIU and take charge of the collection and release of the regional information, the organization of meetings and summits and the integration of resources. This time the delegation has visited some local organizations like ALDAR PROPERTIES PJSC and MASDAR CITY. CIGIU will, as the Director-general of the Union Zhang Jingan has put it, build an open-ended international platform for industrial, scientific, technological and financial exchanges, so as to make a comprehensive and close cooperation with all parties, stimulate the innovative vitality of the market entity, guide and promote a healthy and orderly development of the graphene industry.